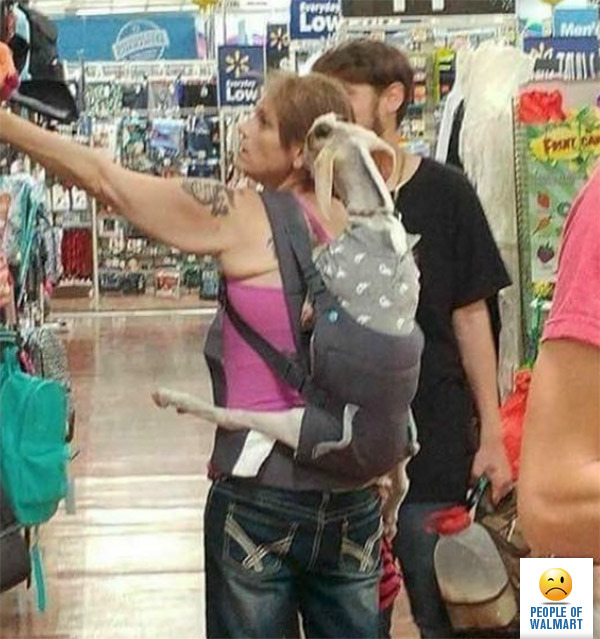 Honestly, I’ve been staring at this for like 20 minutes trying to think of a great caption, but I don’t think there is one out there that would do this picture of a damn goat in a baby carrier any justice. Sometimes a picture might be worth more than 1,000 words. So, it is a goat then; and here I was wondering whose kid it was! Animal abuse — that’s what it really is. I guess she brought her kid. The tat looks like USMC, so maybe she got a bit nostalgic, and felt the need to make some goat stew. She likes to do goat yoga on the go and so that explains a goat in a papoose.It might also explain why she is looking at bags,perhaps the goat prefers to be carried around in a bag like a chihuahua. She likes to do goat yoga on the go and so that explains a goat in a papoose.It might also explain why she is looking for an upgrade. I think it was bring a farm animal shopping day. I’m sure they are passing it off as a Service Animal. We are having the devil with people bringing every kind of “Service Animal” in. Having to crack down on it, for health reasons. What is the guy carrying? Well it must be a service animal. You know every trip to WM kills thousands of brain cells. She must have been shopping too much. Drippings from her colostomy bag. Or the goat’s.